Being self-employed also means being a self-starter, and keeping yourself motivated, because no one else will be there to tell you to get started. I’ve read a lot of books and increasing productivity, and tried a lot of things. The best productivity book I’ve read recently is Essentialism by Greg McKeown. Letting go of distracting projects is maybe the most important thing to do, because it allows you to focus on the important projects. Also, ask oneself, What’s Important Now? (WIN) I find that simple question stops a lot of time wasting. I highly recommend this book. Some iOS apps that I use for productivity: Calm, the directed meditations really help me clear my head when my wheels are spinning. Yes, meditation can really help when you’re stuck on a project. The Simplenote app is a great way to keep a quick list, or take some notes. The best part is that it’s shared among all one’s devices. Build a shopping list through the week as you think of things when on your laptop? Then the same list is with you on your smartphone at the grocery. I find the similar shared device aspect for To Do lists on Wunderlist to be similarly effective. I have To Do list for Work, Personal stuff, and quick focused projects, like taking a trip, or launching a site. Caffeine is an obvious productivity tool for programmers, and I have to say the Starbucks app is pretty useful. They’re going to get my money either way, so I may as well use their digital equivalent of a frequent buyer card. My new favorite Chrome browser Extension is Momentum. It shows up on your new tab, rather than the default bookmarks. It allows you to type in your focus for the day (see Essentialism). Gives the time, which is easy to lose track of. Show the local weather, prevents checking the weather sites. MyNoise.net is a website that provides any kind of background noise you might need while working. Nature sounds, ambient noise, industrial drones, event cats purring. Great stuff. Email is unavoidable, but it has it’s problems. Looking and finding information in email, and being distracted by new email is a common problem. Tools like Slack are good if there is a defined list of people in a project. It’s quick and cuts down on the email noise. Using the P2 Theme by WordPress to organize projects is nice because it leaves a history of ideas, and decisions. My programming environment has changed over the years. Currently most of my work is WordPress Theme development. I’ve switched over to more of Linux command line environment along with Mac OSX to achieve a better workflow. I use the Grunt Task Manager running on node.js. Grunt compiles my SASS files, and SASS is a productivity boost in itself since it’s easier to write CSS. I use twitter Bootstrap as a CSS framework to get mobile responsive websites right out of the gate. I use the latest version of the WordPress.org Underscores starter theme to make my themes consistent over projects, and waste less time fixing incompatibility bugs. For learning new techniques Google search is the obvious choice, but finding the right tutorial can be exhausting. Google is best for quick, small solutions. For ‘big’ learning I’ve had excellent results with Lynda.com classes, EdX.com (MOOC), and good old-fashioned books from the Public Library. A travel efficiency, that is kind of obvious, is carry on luggage only. I’m a big fan of RedOxx, and their Sky Train carry on bag is perfectly suited to me. Great sticky single shoulder strap, and backpacking straps as well. That’s if for now, time to be productive, and motivated. WordPress has a reputation for being blogging software based on it’s history, and the current 60 Million+ bloggers on WordPress.com. The open-source version of WordPress comes from WordPress.org. The widely used blog engine is found on WordPress.com. Confusing? Read WordPress.org vs WordPress.com to understand the difference. We’re discussing the open-source WordPress.org version. This version has evolved into a flexible content management system (CMS) that is widely tested, supported, and secure. 95% of my clients use WordPress to display static pages about their businesses or organizations. There are no blog posts on these sites. I encourage clients to have a business blog, showing their expertise, but blogging is not for everyone. Problem: Your website is difficult to update, and your customers aren’t seeing new information. You need a content management system (CMS). Using a content management system (CMS), like WordPress, allows you to make updates to your website. 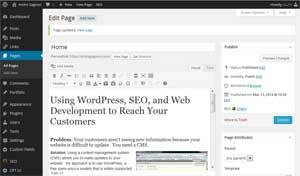 WordPress is a free, open-source system that is widely supported on the Internet. If you can use a program like Microsoft Word, you’ll be able to update your site using WordPress, without needing to learn HTML. It’s easy to use, secure, and allows for future growth of your website. WordPress separates the content of your site from the technology. This makes it easy to update without breaking your website. Let me help you get a new site or an existing site on the Internet using the WordPress CMS. Problem: Your customers aren’t finding you because your website needs to rank higher on search results pages. You need search engine optimization (SEO). 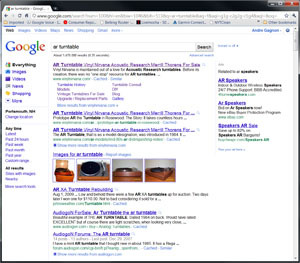 Search engines, like Google, use equations to arrive at a page ranking score for search page results. There are 2 basic tasks to getting better search page results. The first is your website: the internal HTML tag fields of your website needs to reflect your content, and you need to have content containing the keywords for your business. The second part is to have other sites on the Internet refer to your website because of the great content! I’ve helped clients do this very thing. Let me make the technical changes required and show you how to improve the content of your website and get your website linked on the Internet using proven, accepted techniques. All of this is known as search engine optimization or SEO.